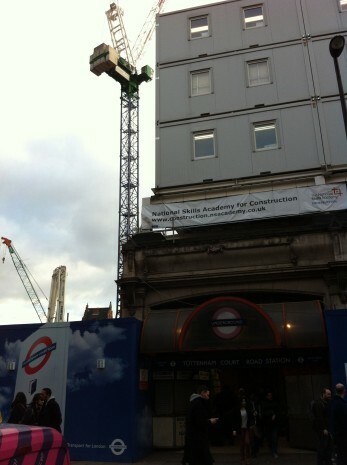 If you have visited Tottenham Court Road Tube station recently then you could have not failed to notice that the station is a construction site. Built over a century ago as two separate stations, it became increasingly apparent that the station was woefully under-equipped to cope with the 150,000 passengers that currently use it every day. The redevelopment work is part of the Tube upgrade plan – an on going modernisation programme to revitalise the infrastructure of the world’s oldest underground transport network. Once the £1bn work on Tottenham Court Road is completed, the station is set to become one of the key transport interchanges in Central London. Significantly this interchange will incorporate one of the new Crossrail stations, currently marked by a huge crevasse that punctuates the built environment of Tottenham Court Road itself. These two significant developments will increase the capacity of public transport in the capital, seeking to pre-empt the issue that by 2031, the population of London is forecast to swell to 8.21 million people (1) If the population of Greater London is included in this figure, 12 million, then the London is regarded as a megacity, a metropolitan area with a population exceeding 10 million inhabitants. At present the five most populated megacities are located in the East, expanding at such an incredible rate that it is resulting in a shift in the momentum of global economic power. It is predicted that by 2050, the global economic landscape will reflect the exponential population growth of these ‘emerging’ countries. While established countries such as the UK are currently considered as economically ‘stable’, expanding economies such as that of China, forecast to be the world’s biggest economy by 2050, are rapidly developing new infrastructure. This ‘copy and paste’ growth is demonstrated by the fact that the five most recent underground transport networks to have opened have all been in China. In order to maintain London’s position as a global economic powerhouse, the Great London Authority has recognised the need to solidify its competitive advantage. In the period of 2010-2011, Mayor of London Boris Johnson oversaw the publishing of three concurrent policy documents: the London Plan, the Mayor’s Transport Strategy and the Mayor’s Economic Development Strategy. These policy documents are explicitly clear in their desire to ensure London maintains its position as one of the key urban cities in the world. Core policies such as improving existing transport infrastructure, namely the modernisation of the Tube and the construction of Crossrail, were identified as being crucial to improving achieving this goal. Crossrail will compress the travel time between Heathrow airport, the main financial areas of the City and the South East region, increasing London’s economic efficiency from a local to international scale. These neo-liberal strategies are what geographical theorist David Harvey considers as ‘spatial fixes’, ongoing solutions to capitalist crises through geographical expansion (2). However in London, as in every highly populated urban environment, transport space is finite. Infrastructure is being redeveloped to maximise current resources with Tottenham Court Road poised to be one of the early examples of the ‘Super Hub’ model in practice. The concept of a ‘Super Hub’ – ‘transport nodes delivering seamless, fast, comfortable interchange with networks of other public transport but offering a variety of services to the customer’ – was proposed in Green and Hall’s 2009 report to Lord Adonis on achieving better railway stations in the future (3). Crucially Transport for London’s authority allows them to implement changes to the urban environment outside stations, such as moving street furniture and adding new road markings. Resultantly stations will evolve from ‘inward looking’ places to becoming firmly integrated with the urban fabric of the city (4). Additionally the creation of new retail space in these developments attracts private capital that in turn allows for the completion of the project. However the high cost of rents will only serve to attract the same corporations who already dominate retail space in the city, such as the usual branches of Costa and M&S. Consequently these developments will become spatially fragmented and corporately homogenised (5). It is clear that the need for a distinct cultural and visual identity is as strong as ever in these new developments. The role of Art on the Underground, the contemporary flag bearer for the rich cultural history on the network, will be crucial in this process. This is exemplified by the commissioning of renowned conceptual artist Daniel Buren to create a new permanent artwork for Tottenham Court Road Tube station. Buren was awarded the commission for his proposal responding to the ticket barriers and Oxford Street entrance, areas recognised by Transport for London’s spatial management principles as ‘decision spaces’ (6). Here all focus must be on passenger decisions in the space. Acknowledging the imposed rules of this space and the fleeting nature of passengers movement, Buren has responded by proposing to fix large diamond and circle symbols, created in his trademark striped vinyl, to glass walls in the station. A cabinet displaying the physical forms of these shapes will also be displayed in the ticket hall. 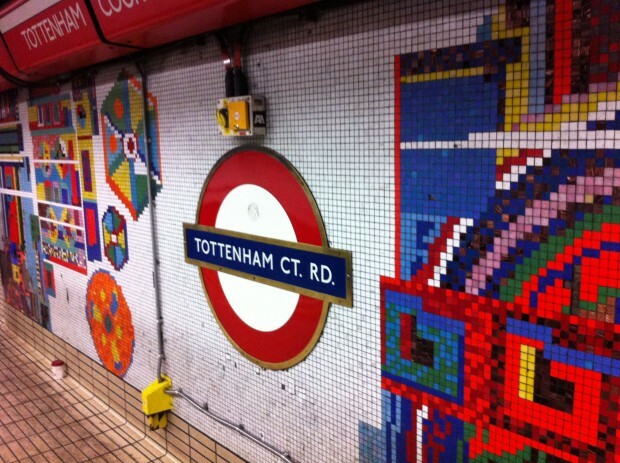 While the Buren commission will play a significant role in creating a new visual identity for the station, the cultural legacy of Tottenham Court Road was forged many years earlier. The 1000 square metres of colourful mosaics that wind along the station corridors, travel down the escalators and spill onto the platform walls are the work of the late Eduardo Paolozzi. Completed in 1986, the mosaics were commissioned as part of the Underground’s Changing Stations refurbishment programme during the eighties. The programme introduced a new working methodology to station refurbishment, one that saw artists collaborating with architects to create artwork for stations. Often these relationships resulted in creative tension between the artists’ modernist aesthetic and the architects overwhelming desire for functionality. This led the programme to be criticised for ‘patching up’ stations with art, which passengers found visually confusing, and far removed from a genuine holistic modernisation achieved through art and design (7). While this criticism was merited, Paolozzi’s creative vision and ambition has ensured that the public has held the work in high regard. 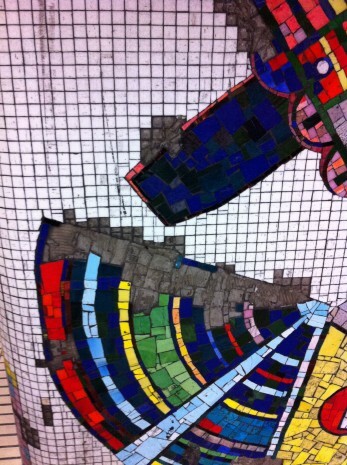 So much so that when news appeared that sections of the mosaics were being removed during the redevelopment process, there was a campaign launched online to ‘Preserve Paolozzi!’ arguing that the coloured mosaics are the most stunning artwork on the Underground (8). In response, Transport for London promised that the mosaics would be carefully maintained and restored where possible, with any removed segments being displayed elsewhere in the station. This means that once the hard hats are removed and the Tube refurbishment is complete at Tottenham Court Road in 2016, the station will play host two site-specific artworks by internationally renowned artists. While these works represent artists from different eras they also represent different approaches to commissioning art in underground transport networks. Consistent with his ‘in situ’ practice, Buren’s proposal has the potential to frame the new architectural features of the station as well as entering into an engaging dialogue about the institutional conditions imposed in such a controlling space. By employing striped vinyl, Buren will allow light to flood into the space, working with the architectural properties of the station to produce a functional yet imposing work. While we won’t be able to see the work for another few years, there is every chance that, in time, these large-scale symbols will come to be as strongly associated with the identity of the station as Paolozzi’s mosaics have. Of course the ability to create a strong visual identity for the network has been arguably the success story of the Underground since the beginning of the twentieth century. From Frank Pick’s visionary hiring of artists to create advertising posters to the challenging Art on the Underground programme, the Underground has employed art and design to create a globally recognised brand and has generated real cultural value. Each line and station on the network has carved out an identity through a wide range of aesthetic and practical devices including architecture, furniture design, colour, artwork and even daily poems at individual stations scribbled on official whiteboards by staff. By working with world-renowned artists such as Buren, Art on the Underground is directly contributing to London’s competitive advantage against other cities and networks, strengthening the image and reputation of the capital on a global level. It does this through allowing artists such as Buren to create new work in a similar support structure to that of a contemporary gallery, but one that responds to the Underground as both a literal and ‘functional’ site. The term ‘functional’ site can be defined by its departure from a physical location, epitomised by new genre public art and socially engaged site responsive practices. This complex environment ensures that realising art is a collaborative and challenging task for curators, artists and the many partners involved. While some may consider the Art on the Underground to be extension of corporate branding, and in essence it is, it forms a key part of public art strand of London’s Cultural Strategy, that of using high-quality public art to enhance the public realm and contribute to the vitality of living in London (9). In this respect, the programme aids London’s claim to be the world’s most culturally significant city. As the Underground is committed to working with Art on the Underground to incorporate new artworks in new major redevelopment of stations, the fate of existing artworks will become increasingly pertinent. Reflective of a flawed arts policy over thirty years ago, the Paolozzi mosaics now represent the inevitability of change within these transport environments. If the artistic integrity of the mosaics has arguably been compromised by redevelopment work, or looking tired and neglected, should they be removed completely and replaced by a new commission? Or should new commissions by artists such as Buren contribute to the development of the overall cultural identity of the site, rather than replace existing ones? Naturally the answer is not straightforward and needs to be arrived at on a work-by-work basis. The popularity and cultural significance of the mosaics, as well as cost of removal, will ensure that they remain in place for many years. However it is clear that Paolozzi’s mosaics raise questions regarding the purpose and durability of permanent artworks in all underground transport networks. This article appeared in Issue 20 of The Shrieking Violet, a Manchester based publication produced and edited by writer, editor, critic and curator Natalie Bradbury. 1) Greater London Authority. (2010). The Mayor’s Transport Strategy, p.15. 2) Harvey, D. (2001). Globalization and the Spatial Fix. Geographische Revue, 23-30. 5 i) Lefebvre, H. (1991). The Production of Space. (Nicholson-Smith, Trans.). Oxford: Blackwell. 5 ii) new economics foundation. (2005). Clone Town Britain. 7) Dormer, P (1993) ‘Towards Better Design‘, RA Magazine, no. 38, Spring 1993, p.40. 9) Greater London Authority. (2010). The Mayor’s Cultural Strategy, p.155.